​​How To Use a Vacuum on Laminate Floors? ​When it comes to cleaning your home, there’s one thing you need: a good vacuum. However, not all vacuums are made equal and don’t clean all types of flooring equally. To clean up the laminate flooring in your home, take a look at our top options below that are specifically made to clean your laminate floors. With our buying guide, you’ll be able to make the choice that works best for you. ​The Bissel Hard Floor Expert is great for any homeowner thanks to its small size and light weight. With the quiet suction that's perfect for laminate, you have lots of power to clean your home. ​Use the Shark Rotator Professional to clean your home efficiently with the swivel technology and powerful suction. This vacuum is quiet and easy to use, including an LED light to reach all corners of your home. ​The Eureka can be pushed around easily on any flooring, maneuvers around without a problem, and has great suction power to boot. Use it without hurting your hand since it swivels well and has an ergonomic handle. ​This Dyson Cyclone is one of the most versatile vacuums out there. It allows you to change heads depending on your needs or transform it into a handheld vacuum for easy cleaning. ​Use the Tineco easily with the LED power brush, continuous power mode switch lock, easy-to-empty dustbin, and removable battery. It’s simple to carry this vacuum with you anywhere to do your cleaning before you need to recharge. With the multi-cyclonic technology in this Bissel, you’ll get excellent suction for longer amounts of time. Just plug in the 18-foot power cord and get cleaning with this powerful vacuum that will still be gentle on your laminate floors. Of course, you can use the Bissel on all types of hard floors and carpeting in your home too. Thanks to the easy-empty dirt tank, you can reach in from the bottom to dispose all the dirt with no mess. This Bissel is perfect for every user because it's both compact and lightweight. You can store it anywhere when you're done using it and can carry it up and down stairs without a problem. The specialized hard floor turbine foot allows you to pick up pet hair and debris anywhere while still protecting your floors. The Shark Rotator Professional is an upright vacuum that's both cordless and bagless and can be used for carpets and hard flooring. Vacuum all surfaces in your house using the lift-away button. Just push it to lift the canister away and clean all those hard-to-reach areas. The bristles are made to pick up pet hair and debris and to deep clean all your hardwood flooring while trapping dust and dirt right inside the vacuum. Steer the Shark Rotator around your home with the advanced swivel steering and the LED headlights. These are perfect for getting under surfaces and into those dark corners. Vacuum your whole house before you need to empty it out, so you can clean without interruption. When you’re trying to get around the tight corners in your home, you’ll want a vacuum like the Eureka. It’s easy to maneuver no matter where you need to go, even if you need to get the vacuum head between items or under furniture. The big wheel technology will glide over bare floors with ease without losing any suction thanks to the multi-stage cycle. As soon as you’re done with your vacuuming, you can empty the easy-to-empty dust cup without needing to replace bags or go through maintenance. Your hand shouldn’t hurt at all when you’re done with the ergonomic handle and easy usage, not to mention the swivel technology. When it comes to storage, the Dyson is the best. This stick vacuum is perfect for any home and can be stored easily without a problem. Since it doesn't have a cord, you only have around 60 minutes of run time. Hopefully you don't need to vacuum for more than an hour with the 14 powerful concentric clones sucking up that dirt and dust. The lightweight quality of the Dyson makes it easy to use for all homeowners, as long as you remember to charge it when you're done using it. Save some battery power with the instant release trigger that will ensure you only use power when you're cleaning. The torque drive cleaner head is the most powerful yet, while the soft roller cleaner will be gentle on your floors. You can choose the Tineco for a great stick vacuum option that’s lightweight. It includes a digital motor lithium battery and an LED brush. It’s made to be ultra-quiet while still sucking powerfully with 100 watts to lift the dirt with ease. Since it only clocks in at under 3 pounds, you can even use it to vacuum your ceiling if you need. Unlike other options, the battery on the Tineco is made to be detachable, improving the amount of time you can use your vacuum. Just change the battery to keep the vacuum working as good as new. You won't even breathe in any dirt or dust since the fully-sealed filtration system will lock in all the small particles. Because laminate floors are very delicate, it is important to understand the best way to clean them without causing damage to them. It is important to remember that moisture and wood are not friends. This does not mean that you cannot clean bare floors with a vacuum. Vacuuming your laminate floors can prevent an accumulation of dust and dirt that will cause your flooring to look dull. One thing that help will greatly is to practice regular cleaning of the floors. If a stain happens upon the floor, it is important to clean it up quickly before the stain gets rigid. Regularly cleaning your laminate floors will also help in their long term of care. Obviously, you will want to purchase a multi-surface vacuum cleaner. This type of vacuum can be used on both your floors and carpeting. It will help you to remove the gritty dust and dirt that can scratch your laminate flooring without adding extra, damaging moisture to the cleaning process. If you want to use your vacuum on your laminate floor you need to be sure that the vacuum is equipped with a hard floor attachment and not only a beater bar, as the beater bar will damage your floors. Beater bars usually rotate thousands of times per minute. This high powered cleaning can cause laminate floors to lose their shine. A good habit when you begin using a vacuum on your laminate floors is to not hold the vacuum cleaner in one spot for an unnecessarily long amount of time. It is also good to remember to not drag your vacuum cleaner wheels across your floors as this can cause scratches and damage as well. Instead, lift and place your vacuum cleaner down on the laminate floors when you are ready to clean them. It would be best to use a vacuum cleaner with rubber wheels as they will be less likely to scratch the laminate flooring. Depending on the type of vacuum cleaner that you plan on purchasing, multi-surface vacuums will be much heavier than hard floor vacuums. This means that the vacuum will be more prone to scratching your laminate floor if not handled properly. However, scratches can occur with hard floor vacuums as well. Although moisture and wood are enemies, sometimes your laminate floors will need a good steam. If you purchase a vacuum with this type of function, the versatility will be a bonus as the steam is capable of getting rid of rigid stains quickly and leaving your floors looking like new. There are many pros of using a vacuum on laminate floors instead of just on carpeted floors. Most vacuums that have the capability to be used on laminate floors are upright vacuums with multi-floor cleansing capabilities. Using a vacuum on laminate floors can cut cleaning time in half depending on the model that is purchased. If you decide on a wet/dry vacuum head, you only have to use one cleaning tool as opposed to many. Vacuums on laminate floors provide versatility. Some vacuums can easily convert to a handheld vacuum for hard to reach areas such as under tables and behind beds and dressers. Canister vacuums have a lot of power and a larger dirt capacity which can allow for more cleaning time between emptying. Larger dustbins mean larger jobs. If you want to get in the habit of vacuuming regularly, a larger dustbin can help make this an easier task. Good suction power is an important consideration when deciding on a vacuum. Some vacuums can run on max power mode where suction power reaches 1000 pascals. Other vacuums also use wind suction technology. This is able to create different suction channels that can lift and remove not only surface debris but also deeply embedded dirt. However, most vacuums for laminate floors won’t have the most powerful motor in the world. This is okay because you aren’t trying to pull up dirt and grime from thick, fluffy carpets. Instead, the dirt and dust sits right on top of the surface of the floor. 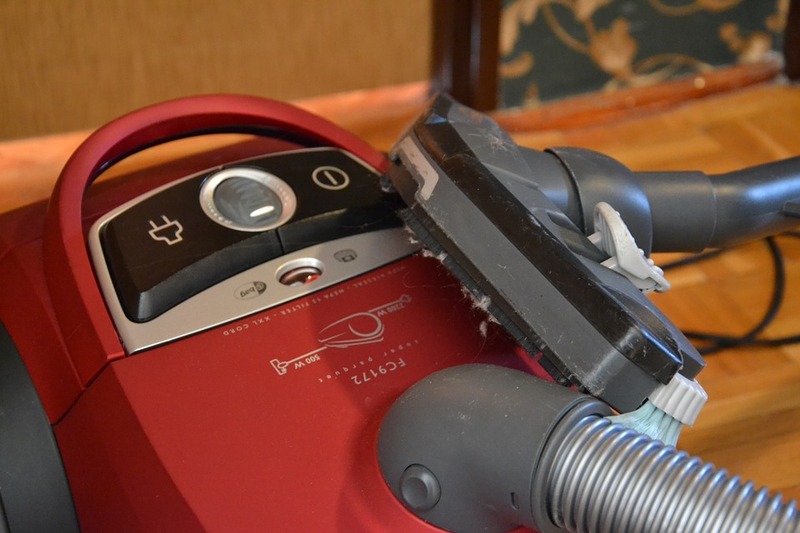 Suction power from the vacuum head is what matters more when looking at the pros of vacuuming your laminate floor. Many vacuums that can be used to clean laminate floors are also bagless. This is a positive thing as you will not have to worry about changing a full dusty bag. Some even have washable filters which you can just empty into your trash bin, rinse, dry, and use again without having to constantly replace the filter. Another benefit is that many vacuums that can be used on laminate floors are cordless. This is great because then you do not have to worry about cleaning a large surface area and getting tangled in the cord while doing so. Some vacuums have dual brush bristles which allow for double the clean. The first brush will deep clean and gather up all the dirt on the surface of your floor while the second brush will give it a nice, pristine shine. ​Choosing the best vacuum for your laminate floors is essential in ensuring that your floors stay good as new. Just remember that delicate laminate floors will require meticulous care. Choosing the right vacuum for your needs will help to keep them looking brand new. Use this guide to help you find the best vacuum that will make your laminate floors look pristine.